Following Silk Road Theatre Project’s Yellow Face and the Broadway-bound Chinglish at The Goodman (read my review), Halcyon Theatre concludes the summer of David Henry Hwang with their admirable, if uneven, production of Family Devotions, Hwang’s 30 year-old play about three generations of Chinese Americans struggling to find their identify in an ever-changing cultural landscape. It’s 1982 in sunny Los Angeles’ ritzy Bel Air neighborhood. Two elderly sisters (Kaori Aoshima and Mia Park giving spirited, if a tad cartoonish, performances) eagerly await the arrival of their brother, Di-Gou (Arvin Jalandoon, offering the best performance of the evening), whom they left in China when they fled the states just before the Chinese revolution. The sisters live with their upper middle-class daughters (the appropriately crisp Helen Young and Eliza Shin), who each have sassy, confident and fully culturally acclimated daughters (Katelyn Foley and Jin Kim) who are bursting to leave the Californian suburbs to forge their own lives. So, yeah: these elderly sisters really are looking forward to their bother’s arrival. Needless to say, when Di-Gou does arrive, he’s not the man they remember. Once an evangelist in his own right, he now denounces God, which sends a shock-wave through the family, thereby uprooting their carefully cultivated American dream. 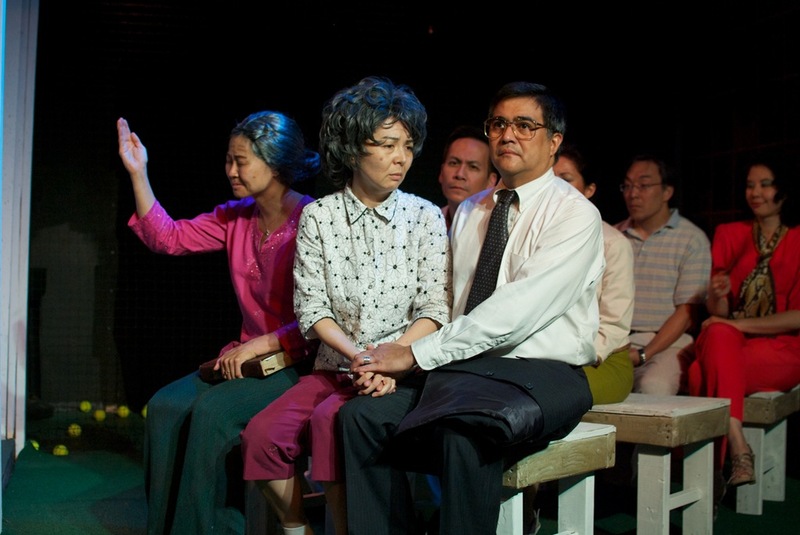 Family Devotions is not nearly as readily accessible as the smart and side-splitting Chinglish; rather, it’s a biting, darkly comedic piece written from a deeply personal perspective. Hwang grew up in an evangelical Christian household in Los Angeles, so he has unique insights into the issues behind fiercely and fully assimilating into another culture. It’s clear that, through this work, Hwang is urging Asian Americans to embrace their heritage rather than shun it. While Halcyon’s production, under the direction of Jennifer Adams, is decent, there are more than a few frantically paced moments accompanied by forced line readings and clunky, distracting blocking. Still, Hwang’s tightly crafted script (which clips along at 75 minutes) zings with personal power.